Each year we try to cover local events, some of which will be live OBs. 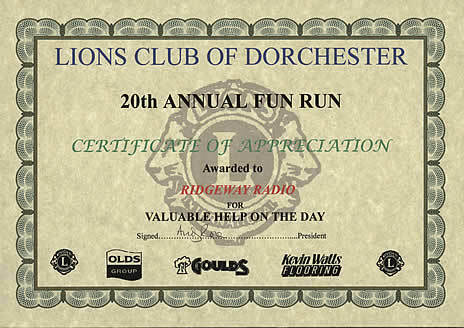 The annual Lions Club of Dorchester's Fun Run is one such event - go here to see our scrapbook page about this. 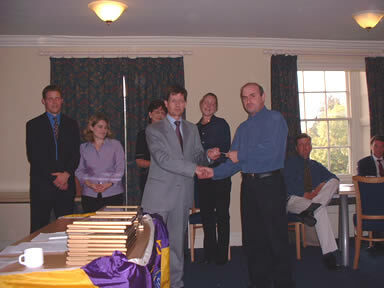 On 17th June the Lions Club distributed the proceeds of the 2002 Fun Run at a presentation evening held at the Colliton Club. Ridgeway Radio were invited to attend and we received a certificate of appreciation (below) and a cheque for the second year running.